Also, imagine this scene. Now imagine it if nobody else saw the cabbage inside the cage. i like how the mayor's seal has an evil-looking version of the dude, when he looks to be a pushover in actuality. Did you see the news clips of the arrests from the City of Bell, California? The clip of the arrest of the city manager, Robert Risso at home? So wait, the Mayor sees the cabbage and he also hears him but nobody else does....schizophrenia? 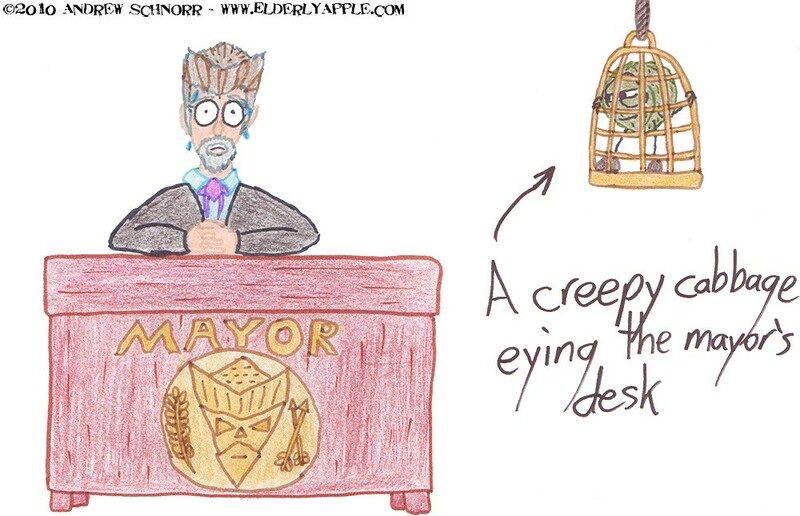 Oh wait maybe that IS the creepy cabbage's evil plan for getting to the mayor's desk. Question - what cabbage isn't creepy?